signed in monogram and dated ‘EL·1864’ (lower right). 7 x 11 in. (17.7 x 27.9 cm.). Starting at about seven, we held a southward course; the plain was one unvaried green undulation. Larissa, and even Olympus, except now and then its highest peaks, are soon lost to sight — and it is only from some eminence — that anything like a satisfactory drawing can be made — yet the very simplicity, the extreme exaggeration of the character of a plain is not without its facination; and the vast lines of Thessaly have a wild and dream-like charm of poetry about them, of which it is impossible for pen or pencil to give a fully adequate idea. (Journals of a landscape painter in Albania, pp. 416-417). A preparatory sketch in pencil, pen, ink and watercolor, made in situ during the 1849 visit described above, and now in the Houghton Library at Harvard University (see P. Hofer, Edward Lear as a landscape draughtsman, Cambridge, 1967, pl. 49) was the basis for Lear’s oil sketch made some fifteen years later. The composition was also the basis for an illustration done by Lear in 1885 of one of Tennyson’s poems. Re-using earlier sketches for later studio compositions was typicial of Lear’s working method. 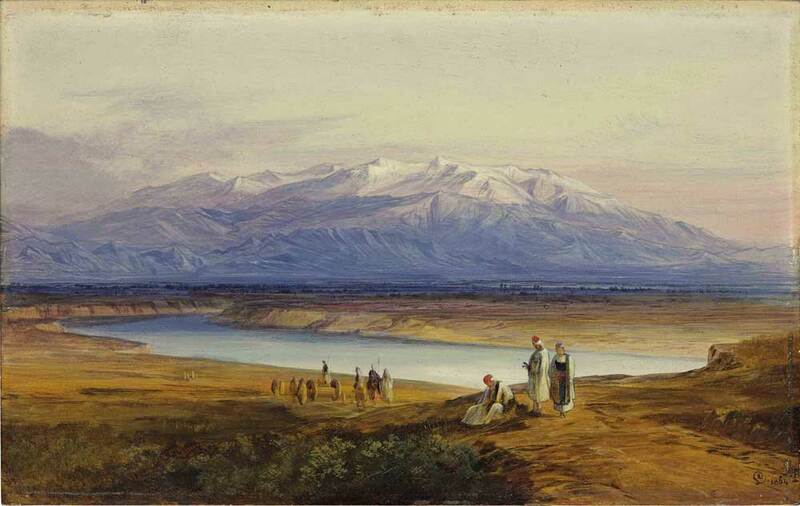 This entry was posted in Edward Lear and tagged Edward Lear, landscape, travel, watercolours. Bookmark the permalink.